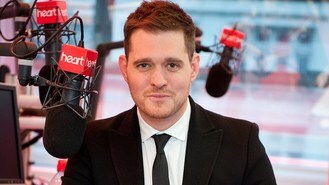 Michael Buble and Robbie Williams have recorded a duet together and found they have a lot in common. Their song will be included on Take That star Robbie's follow up to Swing When You're Winning. But the Daily Star has reported that the pair have become good friends outside of the recording studio, too. Michael, 37, said: "Robbie has probably been more open than I have with certain things. I'm pretty open but he's bared his demons. "I have the same demons, so we talk about all the things I think about as I don't have other people to talk about them to. It's pretty awesome." Michael, whose next album To Be Loved is due out on April 15, said: "I have truly enjoyed my conversations with Robbie. Both of us were dealing with the insecurity, both of us were dealing with everything about the way we could live, both of us probably do what we do too much." Robbie, 39, has recently become a dad to daughter Teddy with his wife Ayda, 33, while Michael and his wife Luisana Lopilato, 25, are expecting their first son this summer. Michael said: "Robbie and Ayda are so great together." He also said it was a great experience recording the duet: "I got to know Robbie through The X Factor and I love him. "The song is for his new swing album and it's so good. We had too much fun making it." Depeche Mode's Martin Gore has revealed he doesn't know what advice to give his children, as the music industry is so tough these days. X Factor star Lucy Spraggan has landed a record deal. John Legend has revealed that he has been surrounded by strong women his whole life. Justin Timberlake's comeback album has sold nearly one million units in its first week. Police are investigating claims that teenage pop star Justin Bieber attacked and threatened a neighbour during an argument. Liam Gallagher has taken a swipe at brother Noel after he performed with two of their old Blur rivals, Damon Albarn and Graham Coxon. Alexandra Burke is set to perform a musical tribute to Billie Holiday. Usher is to perform at the next Rock and Roll Hall of Fame induction ceremony in tribute to Quincy Jones. Sandie Shaw has complained that the music industry is dominated by "Simon Cowell-type stuff" with the artists as "mere puppets".